I grew some poppies this year that are bred for their seeds, for use in breads and baking. The clever thing about them is that they don't open up and spill their seed. They stay closed up so you can pick them when you want. Not too many grew but I did have a line of them down by a patch of beetroot. 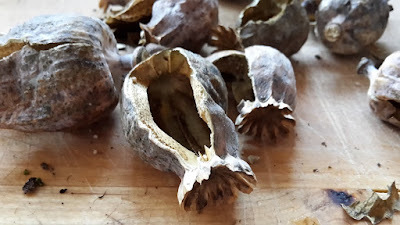 Once I harvested them I let them dry in the greenhouse for a while before collecting their seeds by breaking open the seed heads, a strangely satisfying job! I didn't get huge numbers but each seed head contained lots (just not many seed heads!). I won't use these for baking but instead sow most of them next year and see how many I get, I'm planning on dedicating a bed (10ft by 4ft) to them next year as they're really pretty as well. Does anyone else grow poppies for baking with? I'll send you some seeds later in the year if you like Dawn. I would like to grow some poppies next year Kev. It will give the veg plot more of a potager look and attract insects to pollinate flowers and hopefully destroy nasty aphids. I love the smell of freshly baked bread. Same Dave, send me an email with your address and you can have some to. I think they're all edible so no worries there, just these keep their seeds until you're ready to have them. I was going to say the same as Sue. 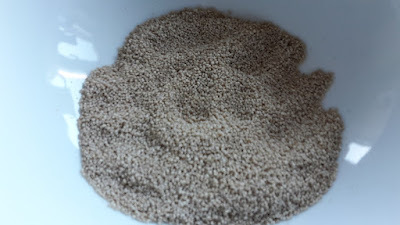 I believe that if you eat poppy seeds, you can be tested positive for heroin. Beware. Growing poppies, eh Kev? Going to put those Afghan farmers out of the heroin trade, right? bread indeed! wink wink. No idea what you mean [quickly hides heroin farm]. Not bleeding the poppy heads here yet! Another project for us to have a go at next year perhaps! A very pretty one as well! Were they sold as poppy seed for bread Kev.? 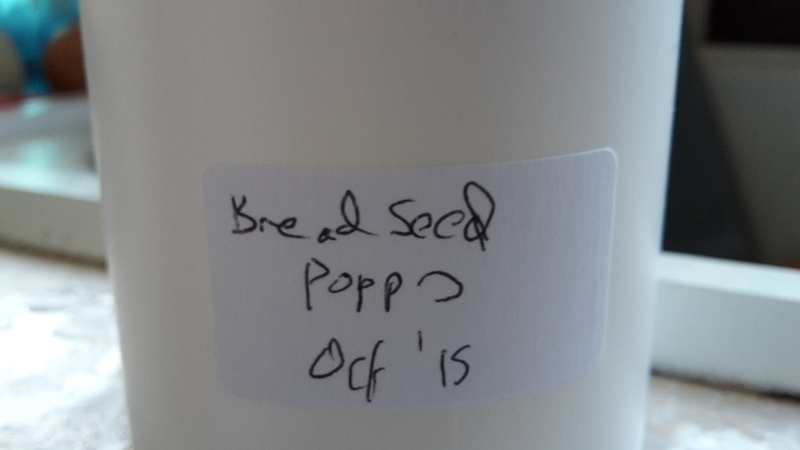 Yes, they're called bread seed poppies, with white seeds that are meant to taste better. Hi! I was directed over here on the recommendation of Dawn McHugh. (Thanks, Dawn!) 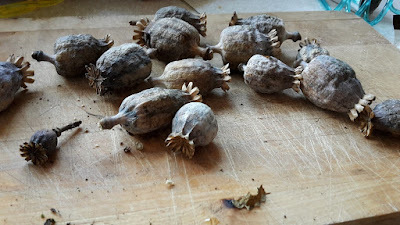 I was harvesting seeds from our purple poppies a week or so ago -- I'm trying to cover the homestead with them -- and hubby asked me if I could save the seeds for use in baking. I'm not very knowledgeable regarding poppy seeds and whether you can safely ingest seeds from just any poppy or not. The ones from mine are a light gray and very, very tiny. Not like those I buy for baking. Quick story: A friend went to visit her son in Alaska who flies for a small airline. He asked her to bake him his favorite dessert which was Poppy Seed Cake. She did so and the next morning they had a random drug test at work. He failed it flat. Very embarrassing and difficult to explain! Hi everyone out there, am Ronald and I would like to have some poppy seeds to cultivate. I live in South Africa hope it can grow here.